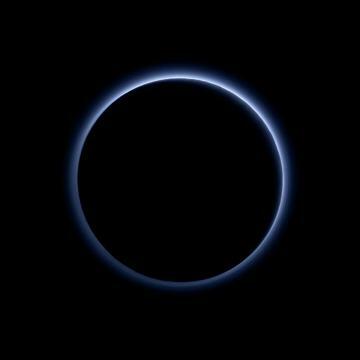 The first color images of Pluto’s atmospheric hazes, returned by NASA’s New Horizons spacecraft last week, reveal that the hazes are blue. “Who would have expected a blue sky in the Kuiper Belt? It’s gorgeous,” said Alan Stern, New Horizons principal investigator from Southwest Research Institute (SwRI), Boulder, Colorado. Scientists believe the tholin particles form high in the atmosphere, where ultraviolet sunlight breaks apart and ionizes nitrogen and methane molecules and allows them to react with each other to form more and more complex negatively and positively charged ions. When they recombine, they form very complex macromolecules, a process first found to occur in the upper atmosphere of Saturn’s moon Titan. The more complex molecules continue to combine and grow until they become small particles; volatile gases condense and coat their surfaces with ice frost before they have time to fall through the atmosphere to the surface, where they add to Pluto’s red coloring. In a second major finding, New Horizons has detected numerous small, exposed regions of water ice on Pluto. The discovery was made from data collected by the Ralph spectral composition mapper on New Horizons. The New Horizons spacecraft is currently 3.1 billion miles (5 billion kilometers) from Earth, with all systems healthy and operating normally. New Horizons is part of NASA’s New Frontiers Program, managed by the agency’s Marshall Space Flight Center in Huntsville, Alabama. APL designed, built, and operates the New Horizons spacecraft and manages the mission for NASA’s Science Mission Directorate. SwRI leads the science mission, payload operations, and encounter science planning. Click on the image for the full image and caption.